They boast some of the oldest vineyards on the planet, yet you'd be hard-pressed to find a bottle from the tiny Spanish isle of Formentera or Greece's Santorini in your average wine shop, let alone an exciting cuvée from Corsica or Sicily. But after decades of obscurity, lagging quality and image problems  and just as oenophiles are growing increasingly weary of the homogenized bouquets available in the global market  a new generation of Mediterranean island producers has emerged. They are offering wines far removed from the easy-quaffing profiles of many Old and New World crus, and they are breaching the wine world's most venerated bastions. On a recent Saturday, the Caves Augé  Paris' oldest wine cellar  held its first-ever tasting focusing on wines from Mediterranean islands. A full house of curious drinkers discovered the exotic, fruit-redolent bianco gentile from Corsica's Antoine Arena and the floral, springwater-fresh mavrodaphne from Cephalonia vintner Vlavis Sklavos. "People are happy to try new tastes from local varietals of different lands that don't have the same way of vinification," says Sklavos. "We try to not manipulate the wine  no filtering, nothing added, just pure wine." For Augé owner Marc Sibard, the scene is confirmation of a paradigm shift. "Everything has evolved, the mentalities of consumers and of the winemakers," he says. "Today, these winemakers have understood survival won't be achieved through cabernet, chardonnay and overoaked wines for [globally influential wine critic Robert] Parker." According to wine dealer Georgios Ioannidis, a new breed of artisanal winemakers began appearing in Greece in the 1990s. He characterizes them as "rather intellectual and refined" vintners who were "seeking the expression of the fruit and stone  not the expression of modern oenology." Today, Ioannidis supplies cellars from Luxembourg to Tokyo with wines by Greek producers whose styles of winemaking share traits with the oldest forms of viticulture. On islands like Santorini  where the sandy, volcanic soils were first planted by the Phoenicians and have been tilled for nearly 3,500 years  vintners are able to work with antique varietals long forgotten elsewhere. The island escaped the 19th century phylloxera epidemic that ravaged vineyards and erased countless grape varieties on continental Europe, and thus boasts vines up to 500 years old. It is the only place in the world where you will find a white wine like Haridimos Hatzidakis' Pyrgos cuvée, made from the grapes of 100- to 400-year-old assyrtiko vines and exhibiting a profound, almost ethereal minerality. For Doug Wregg, sales and marketing director of innovative U.K. importer Les Caves de Pyrène, this kind of originality is precisely what the Mediterranean's wine-producing islands share. "The islands provide an archive of unusual grape varieties, as well as their own utterly unique microclimates," he says. They can produce a red wine as singular as Sitia, from Crete's Yiannis Economou, evoking apricots and mandarins, or Sicily's earthy yet elegant nero d'Avola, produced by young vintner Arianna Occhipinti. 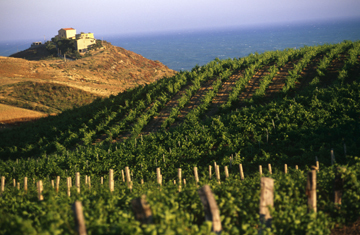 "People think that Sicily makes only dark and difficult-to-drink wine," Occhipinti explains. "But we are working hard to change mentalities." Marco de Bartoli has done as much for Pantelleria, the tiny volcanic island southwest of Sicily, where he creates wine in the style of the ancient muscat of Alexandria. Judging by Bartoli's sweet passito di Pantelleria cuvée, with its rich orange-blossom and caramel aromas, it's no wonder the ancient Greeks believed the goddess Tanit seduced Apollo by slipping him this kind of intoxicating nectar. Les Caves is organizing an "island taste-off" in London in October, pitting Bartoli's elixirs against the likes of a cannonau-dominant blend from Sardinia's Panevino winery and the amphora-fermented frappato of Sicily's Azienda Agricola COS. "People are astonished because they have preconceptions or prejudices that the wines are going to be clunky, and yet they are floral, delicate and fresh," says Wregg. That freshness is due in large part to the proximity of the sea. Wine authority Jancis Robinson has referred, for example, to the "quintessentially marine Mediterranean quality" of Cap de Barbaria winery's monastrell blend. With cool sea breezes caressing the island of Formentera, Cap de Barbaria's grapes ripen slowly at temperatures rarely exceeding 29 degrees C, while mainland Spanish vineyards bake at 35 degrees C to 40 degrees C.
Similar conditions allow winemakers like Antoine Arena or Jean-Noël Luigi of Clos Nicrosi on Corsica's northern peninsula, Cap de Corse, to create exquisitely balanced, sweet muscatello wines that rival Sauternes. They can also produce astoundingly aromatic dry whites, with their bianco gentile or vermintino grapes capturing the essence of the salty air. "With their climate; this saline, iodized aspect to the wines; magnificent terroir and varietals," says Gault Millau's wine-guide editor Pierre Guigui, "I'm convinced that Corsica has some of the greatest white wines in the world. Unfortunately, or fortunately, it's still not well known." But word is spreading, with serious oenophiles increasingly scouring shelves marked "Miscellaneous" in their local wine shops. There are even specialized, island-hopping wine cruises  like Arblaster & Clarke's "Athens to Malta" tour  for those driven by the prospect of finally tasting something new and the knowledge that there are incomparable, ancient vineyards throughout the Mediterranean sea, waiting to be rediscovered.